Harman and Samsung announce world's first QLED in-car display | What Hi-Fi? Ever since Samsung bought Harman International for $8bn back in 2016 we've been waiting to see the fruits of this partnership. The first step was Samsung packaging AKG headphones with its Galaxy S8 and S8+ smartphones, and now we're seeing a key Samsung technology adopted by Harman. Harman QLED Auto is a new generation of in-car display which uses technology already found in Samsung's premium televisions. Just in case you're new to the tech, QLED stands for Quantum Dot Light-Emitting Diode and you can read everything there is to know about it on our dedicated guide to QLED TV. Harman's QLED screens will use direct-lit backlight technology with local dimming - Harman claims this will result in increased power savings which, in turn, will help to improve the range and efficiency of electric vehicles. The partnership will also see Harman offer transparent and flexible OLED displays to car manufacturers. Samsung's OLED displays are used throughout the company's hugely successful range of Galaxy smartphones, including the S8 and Note 8, so it makes sense for Samsung to share this technology with Harman on the back of their relationship. Touchscreen displays are such an integral part of the in-car experience and if Samsung can offer an experience closer to its mobile phones, then it can only be a good thing for the end user. At CES 2018, Harman has also unveiled Configurable Entertainment, an in-car solution developed on the company's AudioworX platform. AudioworX is an open platform which allows manufacturers and OEMs to design and implement new user experiences. Configurable Entertainment allows different passengers to personalise their in-car experiences even though they're in the same space. You could be listening to a concert using audio provided by JBL, while another passenger could be listening to audio with a Harman Kardon character. How? 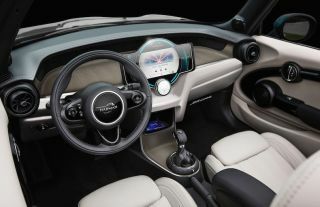 The proposed system uses a combination of audio processing and visual changes, so in-car speakers can alter their shape and sonic characteristics on demand. It's an interesting concept and we'll be sure to head over to the Harman stage to report back on both of these technologies in action.